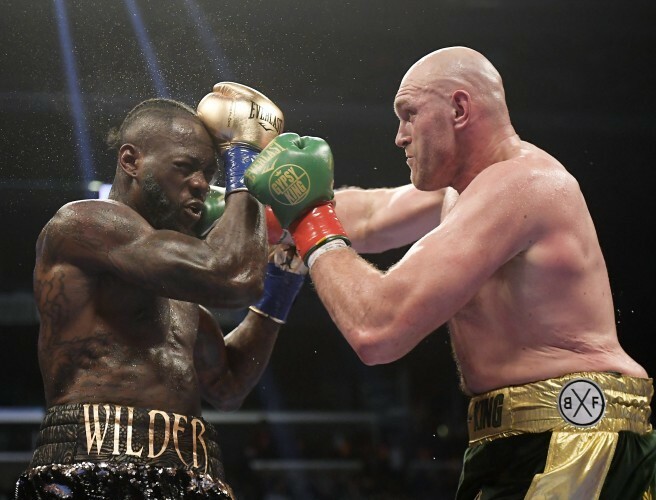 The much-hyped WBC heavyweight bout between Deontay Wilder and Tyson Fury ended in an incredible draw, resulting in Wilder retaining his belt. The Staples Center in Los Angeles was venue to one of the most enthralling heavyweight fights for years, as Wilder and Fury traded blows. Fury was on the mat in the ninth and twelfth rounds, with the latter coming as a result of a brutal combination to floor the Mancunian fighter. Earlier rounds had seen impressive counter-punching from Fury, who revelled in the spotlight following 30 months away from professional boxing. However, the three judges differed in their reading of the fight: Alenjandro Rochin called it 115-111 to Wilder, Robert Tapper had it 114-112 to Fury and Phil Edwards calling it at 113-113 draw. "We are on away soil, I got knocked down twice, but I still believe I won the fight. I am showing total professionalism. Thank you for the opportunity D, God bless you. "The Gypsy King has returned. God bless America. I'm a professional athlete who loves to fight. He is a fearsome fighter. The world knows the truth. Thank you to every fan around the world. "I am a fighting man and Jesus has his control over me, so I was never going to get knocked out. I came here tonight and fought my heart out. [Wilder] is the second best heavyweight, apart from me. We are both going home to our family safe. "I've been away from my family for ten weeks and just want to spend some time with them over Christmas. 100% we will do the rematch. We are the best two heavyweights in the planet. There is another heavyweight who is a chicken. Joshua where are you?" Fury gave a rendition of Don McLean's 'American Pie' in his press conference, having walked in shouting 'Are you not entertained?! '.